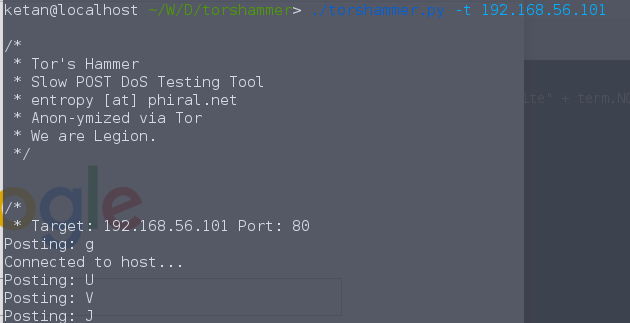 Tor’s Hammer is a slow post dos testing tool written in Python. It can also be run through the Tor network to be anonymized. Kills most unprotected web servers running Apache and IIS via a single instance. Kills Apache 1.X and older IIS with ~128 threads, newer IIS and Apache 2.X with ~256 threads. Torshammer executes a DoS attack by using a slow POST attack, where POST content is transmitted in slow rates under the same session (actual rates are randomly chosen within the limit of 0.1-3 seconds).It will generate number of HTTP POST request and establish the connection to the server If server can’t close the connection correctly, it will get a lot of current connection at same time and lot of child processes/thread will be spawned. Inside of each of connection, it is just only sending some randomize characters to maintain the established connection. When the attack hit the maximum of child process/thread that server can open, it will no longer serve the legitimate traffic and will become unavailable. 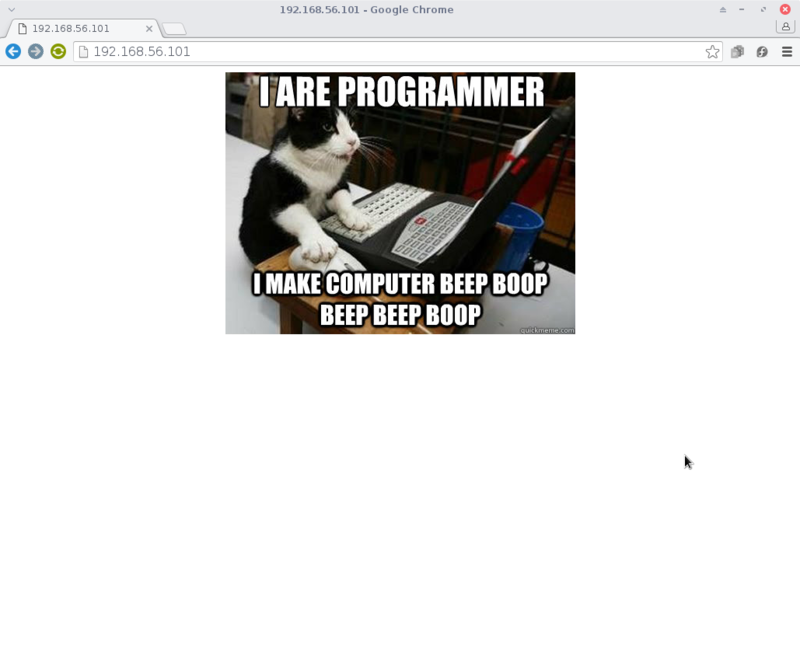 This tool does not need to generate huge attack bandwidth and high HTTP request per second. Just need to hold the maxim current connection that server can handle which makes this tool very dangerous. torshammer.py - This file contains all the code needed to generate malicious packets. socks.py - This serves as a module to provide tunneling through socks proxy (TOR). terminal.py - This is also a module to generate formatted output to terminal. 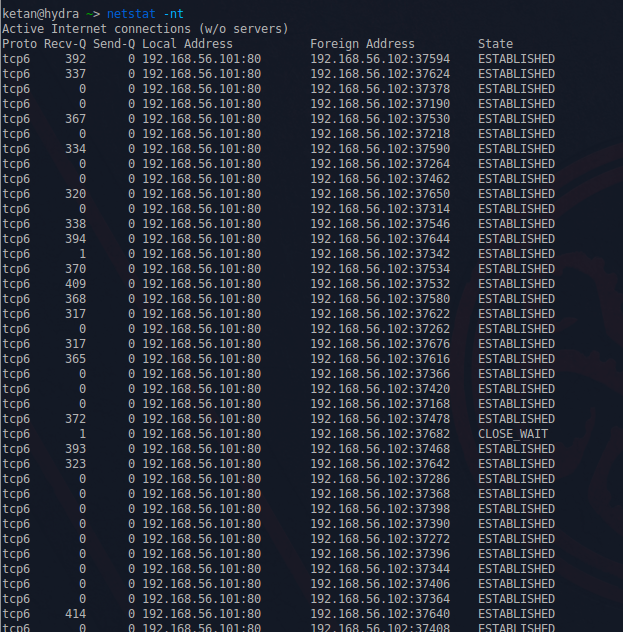 Torshammer selects one of these 20 user-agents while sending POST HTTP requests to the server , thus making it little bit difficult to distinguish from legitimate traffic. It also spawns threads for each connection it tries to make to the server using Thread class from threading module in python. Note that also send Keep-Alive : 900 . This is way it can keep connection ESTABLISHED and prevent server from closing the socket.T o make things more random it delays packet transmission from 0.1 to 3 seconds. Suppose our target webserver is located at 192.168.56.101. Target machine is Ubuntu 14.04 with apache2.4.7 with default configuration. At this point server will become unavailable in a matter of few seconds. 1) Limiting maximum of 20 connection to a user rendered this attack ineffective. This method will work for DoS and not DDoS .It can possibly interfere legitimate users in certain cases. Using RequestReadTimeout directive allows you to specify different thresholds for receiving request data. We can add RequestReadTimeout header=30, body=30 in apache configuration for this module. This places a threshold of 30 seconds to completely receive the request body data. If the data is not received by that time, Apache will issue a 408 Request-Timeout status code.